The California Surf Museum was recently renovated - completely. It's located in Oceanside, just a short paddle up the coast from our facility. Being a life-long surfer, I whothey called on me to help out with the donor recognition boards. I was honored. So I met with the architect who supplied small pieces of glass tile that were part of the color theme. We matched these tiles to a PMS color chart we use in creating custom colored plexiglass sheet. This chart is rather magical as it allows for solid, transparent, translucent, and frosted sheets. Wow. We decided to go with a blue tint with a frosted surface on 1 side. Oh - did I say how BIG they wanted these to be? 8ft tall. It required 3/4" thick material to make the boards stiff enough. Check this picture out. The public rarely sees the gasket used in manufacturing the sheets - but asked for it to be left on to maximize the available material that was cast for the project. 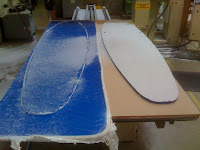 Next, we had to create a surfboard shape that was a blend of the old 60's longboard and an all-around "fun board" shape. I stopped shaping surfboards in 1975, but I have been designing skateboards my whole life (and continue to produce and sell a line of, yes, fiberglass plastic skateboards and clear skateboards too). So I was honored to creat e these donor boards. Here's the machines cutting out the shapes. As soon as I get a great photo of the boards installed at the museum, I will add that. interesting information. 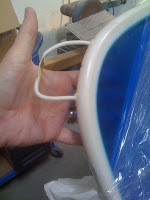 the gasket used in the manufacturing has an special formulation? or it is just like a flexible PVC?